Augsburg itself offers all the recreational facilities of a modern city. Whether you prefer to prefer a walk in the neighborhood or more sports activities such as jogging, cross-country run or Nordic Walking prefer – the beautiful nature with a nearby forest is right at our doorstep. In our new attic there are eight bright and friendly rooms with a total of 17 beds. 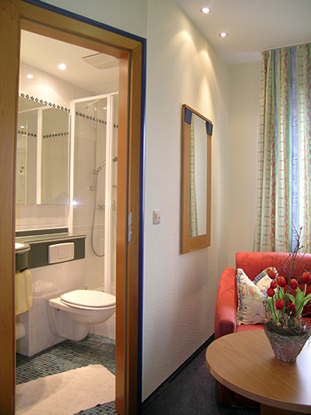 Our guests will find a WC and shower, as well as a hair dryer and a TV in each room. In this quiet and rural location you can spend unforgettable nights and of course we cook for you every day. We are looking forward to your visit. Why not contact us? In addition to cash, check and debit card (Maestro) is open to you and the payment by credit card (VISA / MasterCard). We have eight rooms, of which 2 are single rooms and 6 double rooms. If necessary, the rooms can be added to each bed. Do you want to book a Bed & Breakfast, please fill out this form. Cancellations are free of charge, up to 48 hours prior to planned arrival, any cancellations after this deadline or no-show guests will be charged a fee of 80% of the total room rate. We generally hold your reservation until 5 p.m. on the planned date of arrival. Please submit your credit card number as well as the expiration date in the message box, so we can ensure your reservation in case of a delayed arrival. Independent of your arrival time, your room will be kept available for you the entire night or respectively till the end of our front desk service hours. Cancellation of breakfast is accepted until 6 p.m. the day before, otherwise it will be charged to your bill.